Anglon is an area (Zone) in west-central Embermark. A once-proud bastion of civilization, its proximity to the site of the first Breach means that many of its mighty cities were the first to fall. This made the entire area one of the greatest sources of ruins in the entire continent. 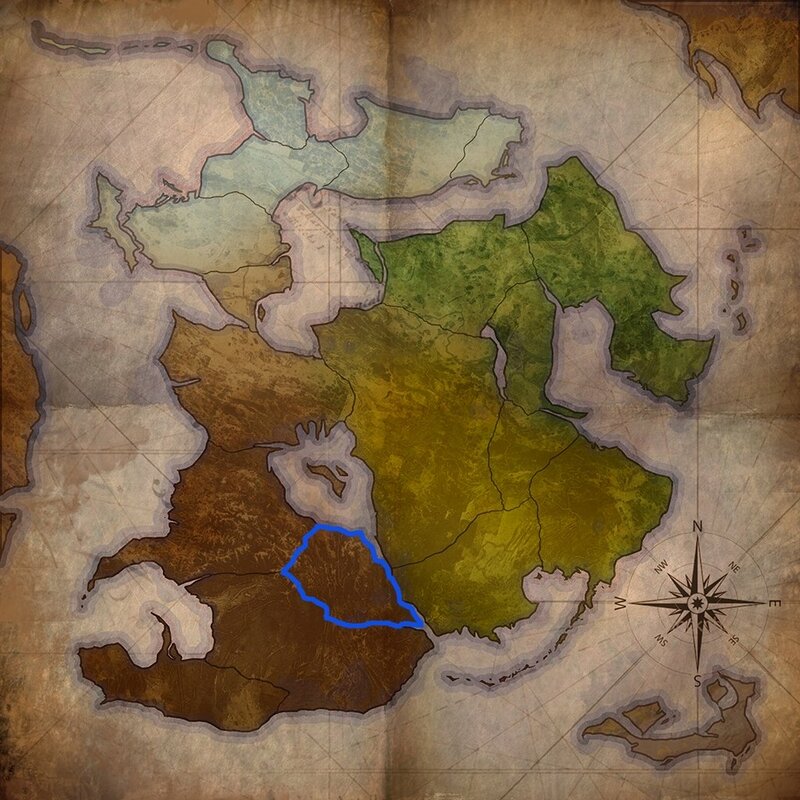 On the Embermark World Map, the first Breach was located on the island there in the center of the continent. But it wasn't always an island, and that wasn't always a great body of water (we'll get into that later). Once the pinnacle of human achievement, Anglon was home to vast structures, gigantic strongholds and sprawling cities. As the Collapse ensued, the worst of the beasts that poured through the Breach ravaged Anglon cities, toppling spires, destroying walls and leaving many a stronghold a smouldering husk. Since then, the natural richness of the land has taken over, growing jungle and other flora over the ruins of those long-dead cities. Now, the area is home to those who’ve learned to adapt, harboring secret refuges of lost civilization as well as savage surviving bands of magickal humans and others like them. Now on to The Hunt. Should you take up your bow and head toward the trail, your quest is for the 5 other Great Ruins of Anglon. 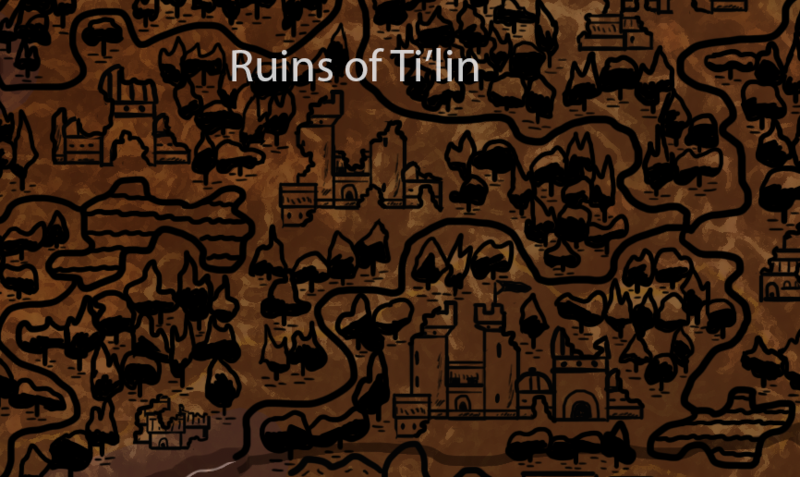 Above, you see the Ruins of Ti'lin. There are 5 more in Anglon and you must find their names. The good news is that they are all identified in Embermark as "Ruins of..." or "... Ruins." The bad news is that they could be anywhere in the Exiles world that's been shared. If you've been following along all over the place, you'll know where to look. and so the hunt begins!!! Good luck everyone! What other Web sites have an EoE presence? Do I have to PM them all at once or can I send you PMs as I think I find them? I'd prefer all at once, but if you're looking to get confirmation on them, fire away. Nah, we confirmed with Wiz that there aren't ruins listed just on the pintrest page alone. Since that gallery requires a log in to view and would be unfair for those that didn't have accounts. 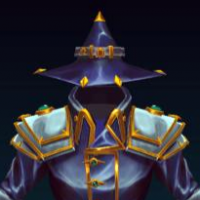 I'm wondering if Anglon is the result of the community design quest. Was anyone else envisioning Anglon as this zone https://us.v-cdn.net/6025810/uploads/editor/oc/sdteldsn66up.jpg ? did not find anything but that doesn't mean there not i them i just may have not seen them. @Nezuja I had thought the same thing, but Anglon is actually the zone that touches the Northwest corner of the zone in the design quest. Yeah it's not the Design Quest one, though I'm almost ready to pick those threads back up, so if you're interested in contributing, go check them out. I am knowledge, I am nothing, I am bound, am I bluffing? Hmm...It'll be interesting to see the reveal and where all five were found! I sent my list in this week. I certainly learned a lot about the game while looking! That's one of the best things about these hunts! I know, but I'm still interested in case I never get the right answers! And there will be moar Hunts, everybody. Stay strong!